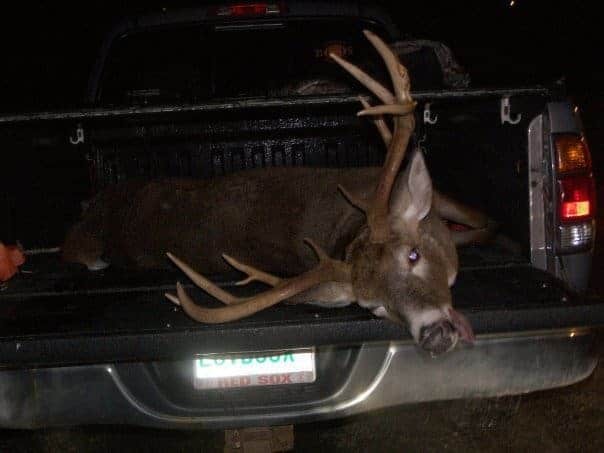 Ryan Hammond's 11 Point 195 lbs NH Buck - the4pointer.com | Real Hunts. Unreal Stories. “It was November 28th, 2009 with no luck in the morning stand. The wind was whipping and howling the worst I’ve seen all year. So Dad and I made our way back to the house for some lunch. As we sat there eating lunch, we wanted to just take a walk through the woods to see how close our stand was from the house. I had contemplated taking my bow to shoot a doe, but the wind was by far too much for any bow. I knew the area we would be going through and knew if I got a shot, it would be a quick one. So as we headed out, rifles in hand, we slowly made our way up the hill. I knew on the other side of the hill, in the valley, there were some friends playing paintball and that no deer would go that way. So I decided to walk the ridge, and if anything spooked it would make its way to my Dad. I had reached the top of the ridge, so I checked the wind, put a little doe scent on myself and made a few doe bleats. Then I made my way down the ridge, stepping over a big down tree. As I stepped over the tree, I caught movement and heard sound to my immediate right, and not more than 10 steps from me, was my buck bedded down looking straight at me. As he got up and started running away, he took two bounds and turned broadside to head down the hill. As he turned, I got a scope full of hair and squeezed that trigger because it was a now or never moment. “Dad heard the shot and called. 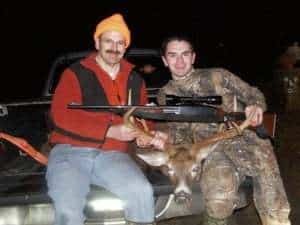 Being 16 years old and having shot the buck of a lifetime, I could barely speak or sit still. As Dad came up, we both started looking for a sign of a hit deer. We then found small blood spots. They were few and far between so it was not a good shot. We followed the trail and tracks on and off for about 2 hours and approximately a mile long. The trail lead us into some heavy pine and hemlock trees, which looked like a deer heaven by all the sign. Then I caught movement again, looked up, and saw my buck stand up broadside to me. I didn’t see any lethal shot holes on him, I was not about to let him go any farther so the best shot I could take on him was a neck shot. So I took it and he dropped. As we anxiously made our way closer to him, he began to pick his head up. So one more lethal shot had to be made to put this deer down. It wasn’t until then that we had an idea of what caliber buck I had shot. He ended up, fully dressed, weighing 195lbs. When skinning him, we noticed he did not have any fat on him what so ever. I then later had him scored at the Yankee Sportsmans Classic show by the Vermont trophy club and he came in at 150 1/2″. He has a main frame 10 with matching kickers off of both g 2’s, but had broken one of the kickers off. 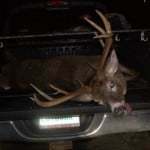 I find it interesting on his right antler he has two holes in his antlers from what looks like a parasite. 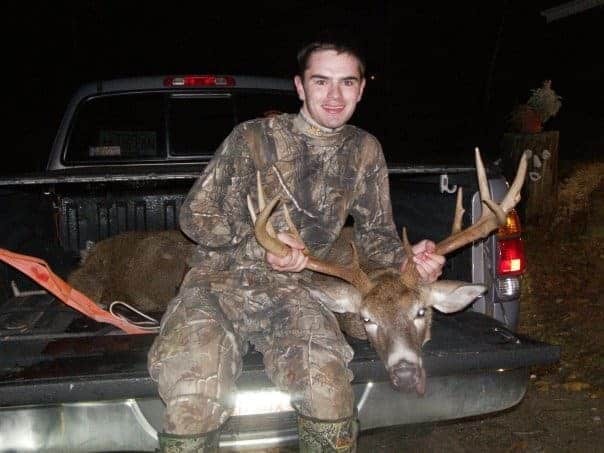 After all the countless days put into scouting, hours in the field, early mornings and cold days, he sure is a deer of a lifetime for a 16 year old in New Hampshire.